The SiT Team wishes you a merry Christmas and a happy new year. We’ve got only a few bits of news for you at this time, this is unfortunately due to the developers being very busy meeting deadlines after deadlines at their work, which has resulted in postponing the release of v4.0. So if you are a developer and would like to help out, please join us at IRC and lets have a talk. We’ve got some great news too. We got some improved Dutch translations with better wordings, thanks to Arko Kroonen & Jasper van der Marel. After alot of work, we finally got SiT into the BSD ports system which makes it easier to install on BSD. We’ve created a plugins repository, which runs as a test. This should be more user friendly than downloading from SVN. Take a look here to view the plugins listing. We would appreciate any feedback in our forum so we can improve our service to you. The news update this month are few but regardless we do have some news for you. 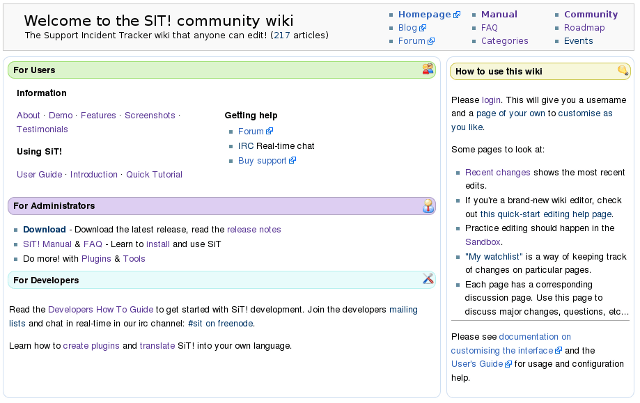 SiT 3.62 was released 18th of July fixing a lot of bugs, read the release notes. This release will probably be the last release before SiT 4.0 is released, don’t worry, we will continue the v3.x branch until around v4.2. Due to the fact that there will be no new features directly in the 3.x releases, you might see new features anyway, in the shape of plugins. During the past year a lot of plugins and dashlets has been created, these contributions might even find their way into the SiT core in v4.x, so one could see these as being test features. The plugins also show how easy it can be to add own features to SiT! without having the terror of overwriting the self-made code when upgrading. If you are a PHP programmer and you would like to help us, you are welcome to join our IRC and/or look in our developers wiki. We are also looking for experienced artists, so if you are one, or know someone who would be interested, feel free to contact us (preferable on IRC or email to Project leader Ivan Lucas). As always, Nicdev007 has made improvements to the Auto create with tags plugin. For those who are not familiar with this plugin, I can make a short description of it. When a mail from an unknown contact enters SiT!, this plugin autocreates the contact, it checks the email domain and binds the contact to this site. It also checks for duplicates. As an addition to my previous plugin, the tms add timeused where you can add an amount of time spent on an incident, when closing the incident, I’ve created a generic plugin that can easily be modified to suit your needs, the tms customfield close. This plugin adds a custom field to the close incident page, the custom field can be renamed to what you want. As a sneak peak I can present a plugin manager which basically, when it’s finished, helps you install plugins, show upgrades, enable/disable them etc. When finished this will be a great addition to SiT! The delay of the release of SiT 3.61, and for my part, vacation. My apologies. Unfortunately as many of you might have experienced, SiT 3.61 hasn’t been released yet though it was scheduled to have been released the 9th this month. This is due to the fact that still a few bugs needs to be fixed, and the developers are very busy for the time being. Hopefully it will be released within the next 2 weeks, but I cannot promise anything at the moment. Bug 1204 is a tricky one, and is the one that we are waiting to finish. Our dear contributer and hang-around Nicdev007 has added a useful dashlet that shows ALL incidents in a select group. Also he has continued updating the Auto create with tags plugin which is now v1.80, this one now handles plugins on its own aswell. A new great feature is that it has the ability to auto create a new contact if he/she is unknown to SiT, by searching LDAP. This time I’ve managed to create an install video tutorial, unfortunately youtube managed to reduce the quality, so you can’t actually see the text written. I’ll work to get the file put for download, if I’m successful it’ll have a link from our wiki. We have some great news for you in this update. The release of 3.61 is shaping up, and is scheduled to be released the 9th of May. This release contains mostly bugfixes. We had a documentation day where we added/updated alot of pages, take a look in our wiki. A nice plugin from Kieran has been added; Incident for contact This plugin creates an incident for a contact when a new contact is created. A big part of the Welsh translations thanks to Jeff Stone and Peter Hughes. We’ve also added a mailing list for translators. Subscribe here (just send an empty mail). We finally got to make the first video tutorial, hopefully more will come soon. In the preparation for the release of 3.60 LTS (Long Time Support) version, which is waiting just around the corner. We have made some changes to our Wiki pages, giving you an easier approach to find help. The front page of the Wiki is redesigned, making it more user friendly. But we have also done some major restructuring to create a Manual. 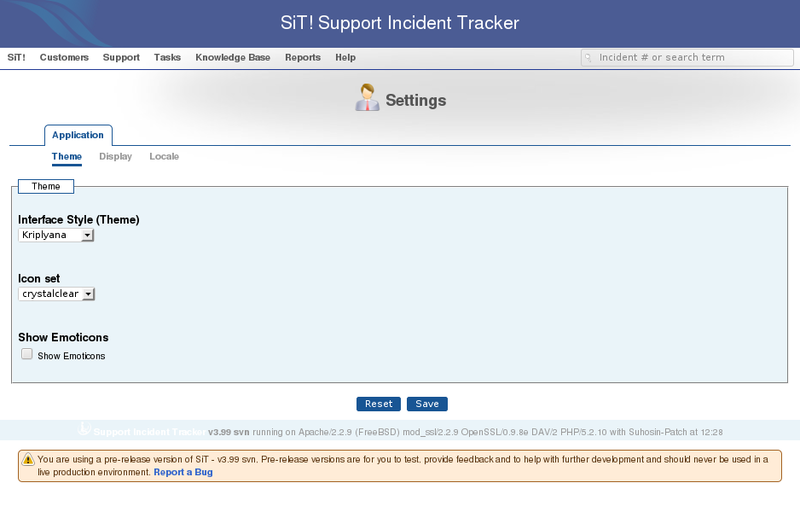 The Support Incident Tracker developers are pleased to announce the immediate availability of v3.50, thanks to the dedicated hard work of our developers, translators and testers. This release introduces LDAP compatibility, improved permissions and significant progress on internationalisation. Improved LDAP authentication now works with Active Directory, eDirectory and more. Improved permissions management, permissions are now grouped by category to make it easier to find the permissions you are interested in changing. It is also now possible to add your own Roles in addition to the three built in roles. Improved internationalisation and new & updated Translations: Bulgarian (Yassen Gorbounov), French (Gilles Grenier), Danish (Carsten Jensen), Italian (Silvio Bogetto). Many more of the strings within SiT! are now able to be translated, we’re working hard towards 100% internationalisation, we need your help with this, please report and any hardcoded English strings that you find. Improved support for Inbound Email, this feature is no-longer being treated as experimental as in previous releases, so please feel free to give it a try. Improved UTF-8 support, better handling of international characters. SiT! was previously limited to supporting 128 users, this restriction has been removed. Plugin improvements: Plugins can now be internationalised and SiT! strings can now be overridden by plugins.